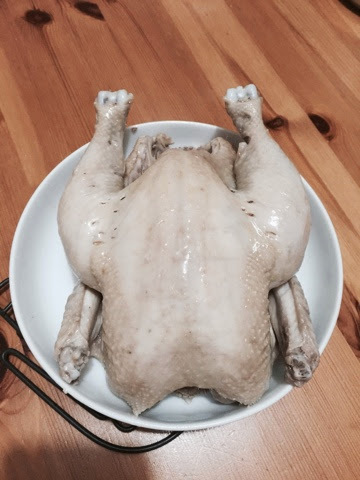 My mum and aunt cooks very good Hainanese chicken rice. I've recently learn how to cook the exact way my mum and Aunty used to cook for me back in Kuala Lumpur. Here is how we Malaysian Hainanese cook our chicken rice. I emphasised on the word Malaysian Hainanese because our chicken rice taste a lot better than the one sold in Hainan, China. I've visited Hainan twice and I never like the chicken rice there (tried their so called local famous and best one). I may be wrong but I suspect the origination of Hainanese chicken rice in Hainan, China were taught by Malaysian or Singaporean Hainanese when they balik kampung. The amount of ginger use depends very much on personal liking. I normally add 3 slices inside the chicken and place additional 4 or 5 strips in water to boil with. Bring a pot of water to boil. Off the fire. Add the chicken (breast side facing down) in the boiling water. Cover the pot with the lid for 30 minutes. Add chicken (the breast side facing up this time) for 25 minutes. Cover the pot with the lid for 25 minutes. Remove the chicken. Prick the chicken (at the joint in between the drumstick and tight) to make sure there is no blood oozing out. If yes, bring the water to boil. Add the chicken and cover the pot with the lid for another 5 minutes. Add chicken soup. Season with salt. Press start to cook.